Are you looking for a sturdy and reliable baby gate? Then you may want to consider the Cardinal Gates Outdoor Safety Gate. The Cardinal Gates Outdoor Safety Gate is made with stainless steel and light weight aluminum. This product is weatherproof, which works well for putting it on patios and decks. It is easy to install. This is hardware mounted. This product will mount at angles up to 30 degrees. It has adjustable width. This gate works well for enclosing pets. This product comes in three different colors: white, brown, or black. Extensions are sold separately. As of this writing there were 76 customer comments and 29 answered questions for the Cardinal Gates Outdoor Safety Gate. I've read through the customer feedback, and then condensed the results into this review. I hope that this helps you when shopping for a baby gate. The Cardinal Gates Outdoor Safety Gate is waterproof. With some of the other gates on the market, customers tried to waterproof indoor gates by painting them with weather resistant paint before putting them outside. For this gate, it is already done for you. This is a great gate for kids and pets alike. Many people use this gate on their decks to keep kids and pets off of the stairs. This gate features a stainless steel and light weight aluminum construction and hardware. This gate can be used safely on stairs since it is hardware mounted. All gates that are used at the top of stairs should be hardware mounted as opposed to pressure mounted. Hardware mounting means that you will need to drill into existing deck or studs. This is the most secure way to hang a gate. "It was quite easy to install as the instructions and YouTube video were excellent!" "This gate, with its slightly curved bottom, allows clearance for molding trim around deck posts." "Unfortunately, they do not offer this option with the extension and you must buy additional hardware either from the company, hardware store, or Amazon. That is my only complaint." "Went for this gate 3 months ago because of price and that its width is adjustable. Seems to withstand weather. Simple to install." 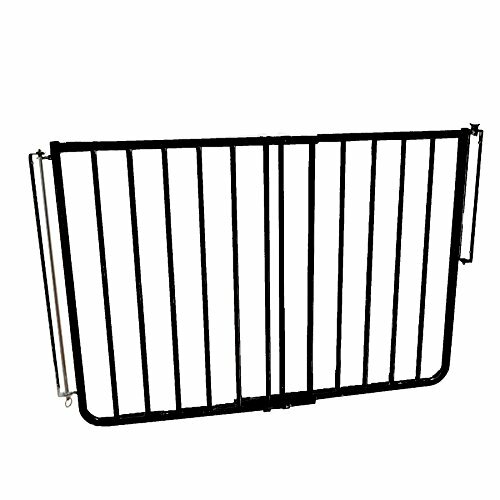 The Cardinal Gates Outdoor Safety Gate is fair priced quality baby/pet gate that is made for outdoor use. It is of the hardware mounted variety, so that means that this gate is safe for using at the top of stairs. Many customers bought this gate and installed it at the top of their outdoor deck gates. This gate received good reviews on ease of installation. If you are looking for a weather resistant gate that is secure, the Cardinal Gates Outdoor Safety Gate may be worth a second look.